Black and Red Community Free-Skool: Our Pedagogy! At our first event, we held a discussion around the questions: why is it important that a free-skool exists? and, what should that free-skool look like? We talked about positive and negative experiences in education and what made them distinct. From there, we moved towards answering those central questions and designing our own pedagogy, one that makes sense for us as a community in Pittsburgh, and one that is ongoing and critical. 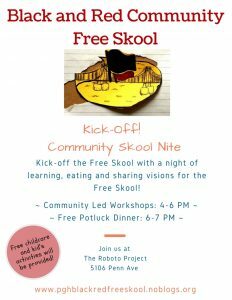 Free Skool Kick-Off Event: March 25! Join us for the Black and Red Community Free Skool Kick off event! We will be kicking off the Free Skool by getting to know each other, eating a meal together, and creating space for our ideas and visions for the Free Skool to be shared and celebrated! Check out our event on Facebook and invite friends to come! Below is further information about the workshops that will be going on at this Free Skool event, as well as more details about the collective. Also, the dinner at this event will be coordinated by Food Not Bombs but we ask folks to bring food potluck style too! If you have any questions or concerns, please feel free to contact us. Current Events – In the age of Facebook, current events have turned into a strange isolated engagement that one usually partakes in alone and from behind a screen. Understanding what is happening in the world and being able to reflect, process, and discuss it together is, however, of essential in sharing our lived experience in a world where so much is constantly occurring. This workshop will serve as a space for that information sharing and collective reflection to happen. Radical Pedagogy and Autonomous Learning – What exactly does a Free Skool pedagogy look like? What are notions of engaged learning and where do they come from? Through collective analysis and discussion, we will work through these questions, as well as others, and together determine the importance of having a Free Skool in Pittsburgh. Home-Improvement Skill Share – Ever wonder how to install a wood burning stove, change the locks on your door, or other handy home-improvement skills? Through this series of workshops, people with practice doing an assortment of useful tasks will share their skills with you, so that our wealth of hands-on knowledge can stretch and expand. Come pose questions, have fun trying something new, or share some of your own tips and tricks. This time’s skill share topic: TBA! Kid-Friendly Crafts – The Free Skool aims to provide a youth friendly space always, and this time around, we will have some extra-fun guided crafts geared especially for younger people! (But anyone interested is welcome to join.) This workshop will be going on during the entire event, so if you are concerned about childcare, know that this is an option! Dinner will be served for free/by donation starting at 6 pm. If you want food, but do not feel like coming to the rest of the event, we still welcome you to come join us!